Keeping your work force safe on the job is of the utmost importance to all of us. 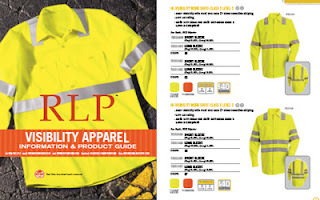 Our 'Visibility Apparel' brochure showcases our premium product line of Enhanced & Hi Visibility uniforms and customizing options. Whether you are required to use visibility uniforms or just want to enhance the safety or your personnel, it's well worth a look. Please note that this brochure is not intended to be a source for making a decision on the type of products you are required to use for your personnel. Please consult the appropriate governing agencies to determine your requirements. Click here or the picture below to view or download the brochure (PDF format, 4 MB).